Standing Out From The Crowd - I'm your PA : The virtual assistant company that likes to make you smile. What makes you different? Why should people want to connect with you? When we go to networking meetings we often have one chance of standing out from the crowd, of being memorable – for the right reason! So how do we do it? You will always come across those who stand on chairs to speak, maybe have a great prop and I have seen some amazing props over the years, but what happens if you have a fear of heights, or don’t want to carry a prop around? For me I live my branding colours of pink and black, so I always have something bright pink, then of course there is being the supportive friendly, smiley person – everyone loves a smiler! What about the 40/60/90 second pitch? Whatever the length of the pitch, being prepared and delivering a confident and snappy pitch is often all that is required to make you stand out from the crowd. It’s interesting how many people would never dream of going unprepared to a business meeting with a potential new client, and yet the same people would never prepare a pitch for a networking meeting! So prepare and practice that pitch. Many people in networking will ask for “anyone” – this is one of my biggest bug bears, being specific brings far better results! So a little tip for you if you are going to network meetings, prepare a list of 10 companies that you would like an introduction to, photograph it and carry it with you on your phone, then share it with people. In general people do love to help, so if they can, they will. 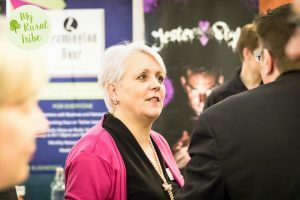 I recently shared my list at a network meeting and had fellow networkers connect me to some of the companies I want to speak to – it is well worth doing. Remember a warm introduction is far more beneficial than a cold call. So yes you can stand out from the crowd, be prepared, know who you want to connect with, help others, smile, be helpful and if you can, live your branding.